How can I add a Blogger or a Wordpress blog to my Q-rator feed? Did you know that over 25% of the websites are built using WordPress? All that you need to follow a Blogger or a WordPress website / blog is the link of that website / blog. We recommend using Library Sniffer. It's a Chrome extension and will immediately tell you the hosting service of the website or blog. Once you have the link, go to My Feeds in Q-rator. 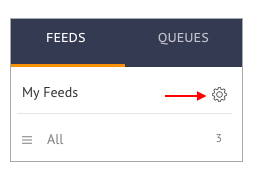 Click on the wheel icon next to it. Enter the URL of the blog / website and click on Search for Feed. Click on Follow right next to its name under Results. Add this to an existing Collection or create a new one. Learn more about what a Collection is. How can I add a Pinterest board to my Q-rator Feed? How can I add a source other than Pinterest, Blogger or WordPress to my Q-rator Feed?